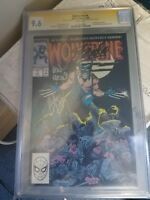 Wolverine: Infinity Watch #2 Fuji Cat Variant!!! XM Studios WOLVERINE 1/4 Scale Statue Figure *SEALED with COIN!! FREE SHIPPING!